As Easter dawns on the horizon, we have emerged out of the dark tunnel of Lent and Holy Week into the light. 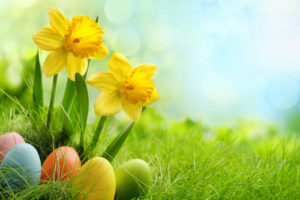 The Easter story reminds us to trust and hope in the risen Christ, because no matter how bleak our circumstances seem, joy lies just around the corner. With God all things are possible. The Easter story reminds us of the God who rescues us from the brokenness of our humanity, who accompanies us and never leaves us alone in all our difficulties and offers us new life and new hope. How amazing would it have been to be one of the women who went down to the tomb that first Easter morning. They came expecting death and sorrow. Jesus their friend had been killed, and now the best they could hope for was to give him a proper burial. Instead, they find an empty tomb, two angelic figures proclaiming Jesus’ resurrection, and an invitation to new life. This encounter with the risen Jesus changed their lives completely. They began by sharing the news with their fellow disciples that day, and then continued to share it to the very ends of the earth. On this Easter day, just like these women, we have been called from darkness into light, from fear into joy, from death to life. Our job now is to follow their example and to go into the world from this day on, proclaiming the resurrection of Jesus. Christ is risen Alleluia! He is risen indeed, Alleluia!